This review is a part of an article on beer cocktails as part of the monthly beer blogging project The Session. Appearance: On the bottom, a hazy red body with blazing ruby highlights. Up top, the traditional deep black Stout body. As time passes there's less of a clear boundary than you get with a Black & Tan, but you can certainly tell the top from the bottom. The head has the classic nitro creaminess with alternating caramel-brown and pink blotches, making it look much like melted rainbow sherbet. The overall presentation is awesome. Aroma: Fresh, tart raspberries and chocolate. Simple, but just what I was hoping for. It's much the same from top to bottom. Taste: At first, much muddier than I was hoping for. The elements just don't interlock and align in that magic way that makes one beer compliment another. 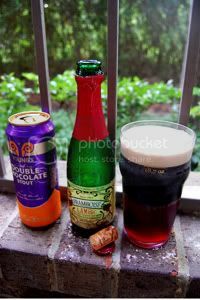 As the Stout starts to run low, the tart raspberry starts to cut through the muddiness decently and you end up with the typical Framboise character with a bit richer body. Perhaps it would be better to totally mix the two different beers to keep a constant all the way through. Mouthfeel: Nitro-smooth at the front, conflicted in the middle, and crisp in the end. Drinkability: While light in alcohol content, you're probably not going to be ordering these all night long. Verdict: While a mix of raspberry and chocolate beer sounds like an awesome combination on paper, the reality doesn't quite live up. My litmus test for a beer cocktail is whether it offers anything better than drinking the beers individually back-to-back. Unfortunately, by that rule, this one is a miss. One of my friends made a very nice hombrewed raspberry chocolate stout by adding some framboise liqueur to the keg. That might be an alternative, although you would lose the aesthetic appeal of the layered look.